Earlier this year, I visited the Huntington. I am one of the lucky few who get to visit the Huntington Gardens all the time, since I live close to Pasadena – but no matter how many times I go, I always learn something new. Since my particular consuming crazy passion is succulents and cacti, it is really hard for me to go anywhere other than the dessert gardens. They are legendary, and deservedly so! Not only because of the amazing collection of extraordinary plants, but because of how they are deployed. These plants are like old friends to me, but this time I saw many of them with different eyes. why oh why won't my A. marlothii bloom? There were so many heart stopping specimens of Aloe marlothii, all in full bloom, and these I rolled my eyes at, because I am SO ENVIOUS! My Aloe marlothii, Willard, hasn’t bloomed in YEARS! WTF? What could I be doing wrong? All of my other Aloes are so happy and put out bloomspike after bloomspike, but my Willard just mocks me, spikeless. So I come to the Huntington to enjoy these succulent candelabras, and dream of the day when I get another one popping up in my own garden. gulp! my heart is beating so fast over this masterpiece! Okay – I am on record not liking massed plantings. I think it is lazy to take a few plants and “stripe them out”; it is an easy kind of drama that one finds often in front of office buildings. But if you take a complex association of plants and run a river of something amazing in the middle – well, then you have REAL drama. Just look at what the Aeonium ‘Zwartkopf’ does in this planting! The huge swath of this dark beauty really brings it – I especially love the textural and color contrast between it and the small leaved gray succulent to its left. Sometimes botanical collections of plants don’t quite hang together as a design – it is planted features like this that turn a collection into a real garden. I am in wild love! Show me a path that conceals the final destination, and I’ll show you a path that makes any space seem bigger and more interesting. Here we have the curve (What could be beyond? A desert oasis? A castle filled with Seven Dancing Princesses?) 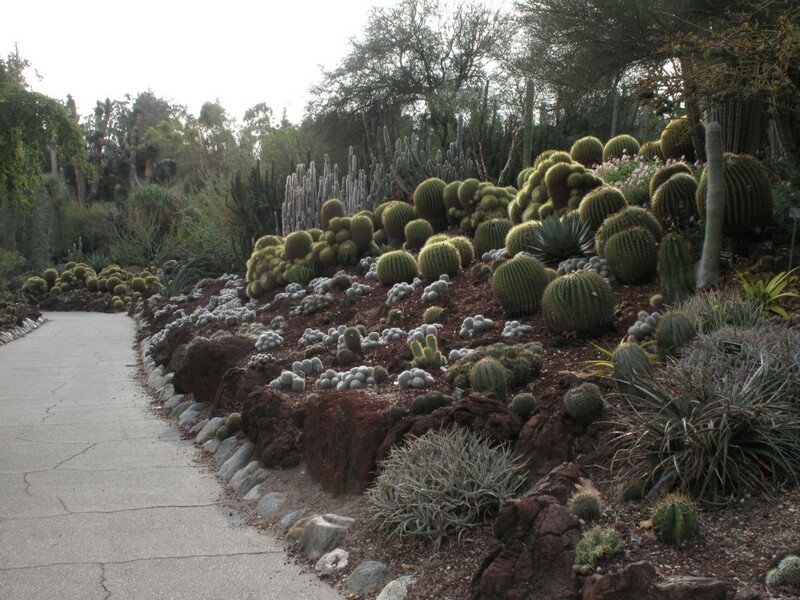 and a striking planting of cacti to beckon you forward. J’ADORE! nature knows her colors, right? 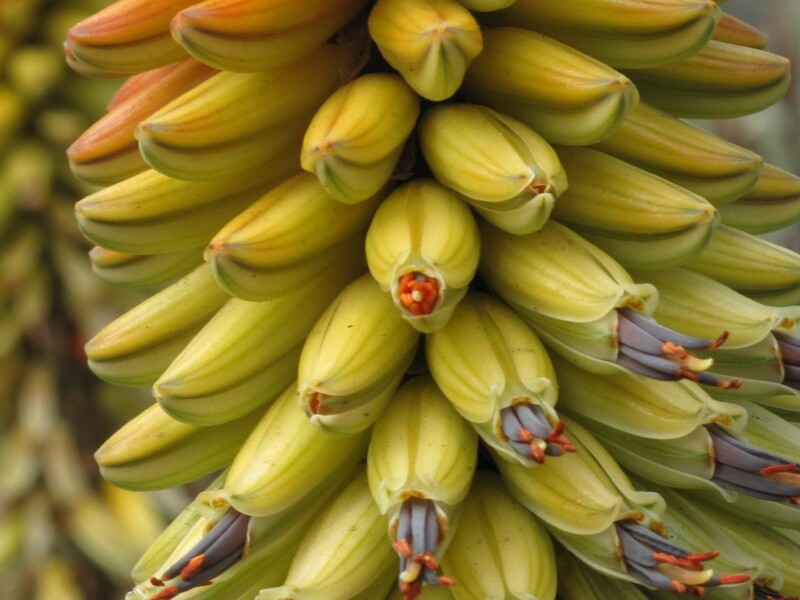 I was totally captivated by the bloom of what aloe I don’t know – I neglected to write a note on it, I was so in the moment! Just check out these beautiful soft colors – a buttery yellow that graduates to a soft, salmony orange as the tubular blossoms move up the spike, and then the glorious lavender purple stamens!!! Ease OFF Mother Nature, you are KILLING me with your chic color combos! I totally want a dress in these colors. STAT! This was my favorite image of the day! I am a stickler for mixing different forms in plant designs – but here, we have just one form that is being repeated with two different plants in different colors. I am an unabashed fan of golden barrel cactus, and these are obviously old stands that have been allowed to have “pups” and mound away. The same is happening with the near-black dyckia – and what an effect this is! It stopped me in my tracks – and this is something in a garden with so many incredible images that every other step is a potential show-stopper. 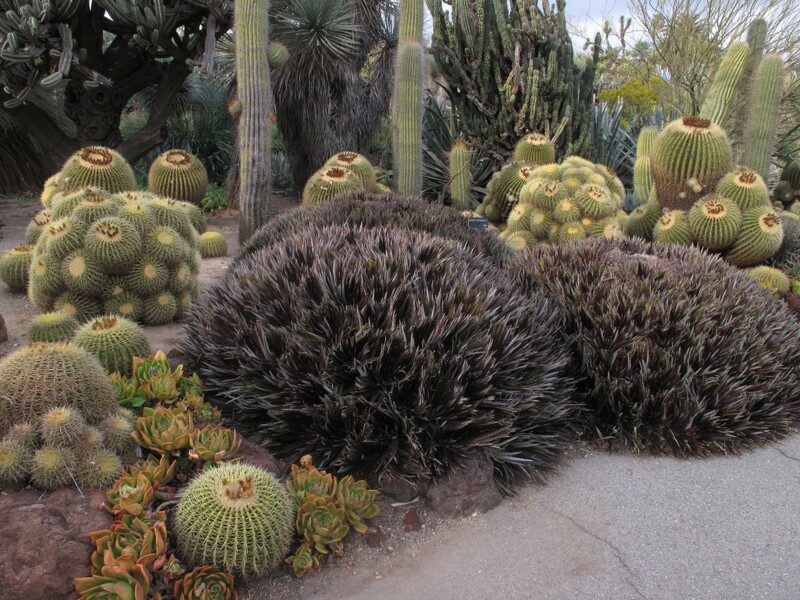 The color contrast and fact that the dyckia’s spiky profile has a finer texture than that of the barrel cactus gives this repetition of mound on mound enough interest to keep us looking, and we are so rewarded when we look! 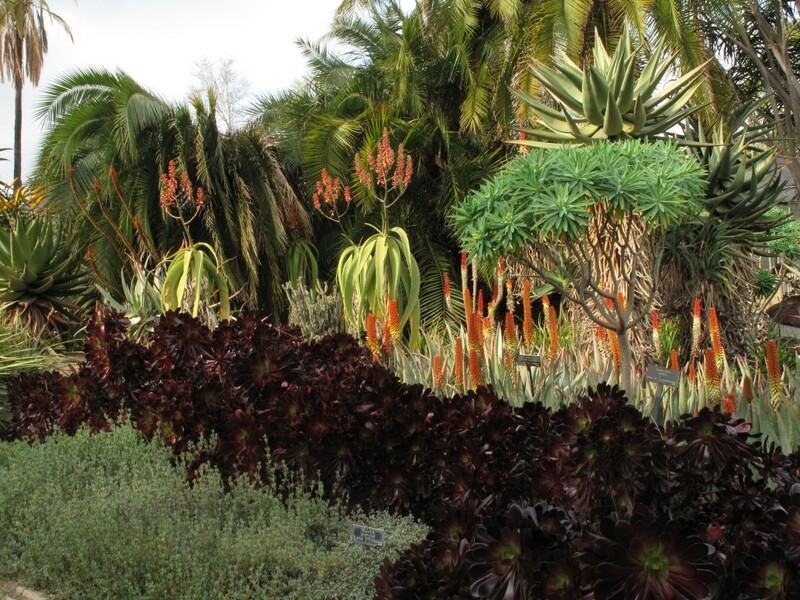 The planting is cuddled into a clearing of large, twisting pachycereus – I was swooning with plant lust! To swoon and to learn at the same time is a wonderful thing, indeed. I’m going back to the Huntington soon because they have just re-opened the Japanese gardens they have been renovating – what will our Germinatrix learn there? The next post is going to be a hard one – I am again turning my lens at my own garden, and it giving it a hard once-over. My garden may never forgive me. I’ve missed you, Germi. Glad to have another aloe post to swoon over. What a wonderful post! 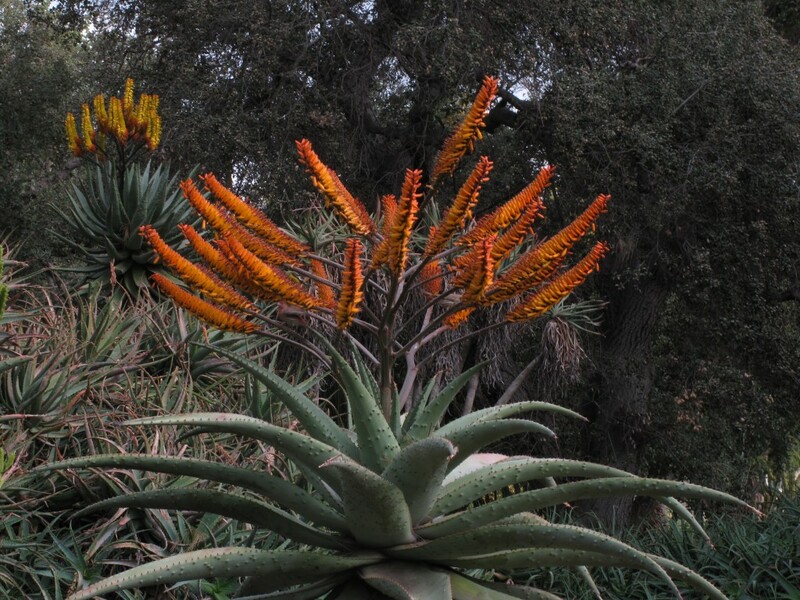 I also went to the Huntington earlier this year but the aloes were not in bloom yet! Darn! My mother in law lives in South Pasadena! Great photos of my favorite plants! I have to get to Huntington at some point. I love the combination of the mounds. That dyckia is amazing. Simply beautiful! You are so lucky to live in proximity to such a gem! I find it hard to get away from my garden in the summer. What’s Pasadena like in the winter? Thanks for that tour. I just love blooming aloes-my “big aloes” are way to young to have those candelabra blooms yet but at least for now I can enjoy A maculata, A vera and the small aloe blooms. Hey, we’re still waiting on that next post! Regardless, I love the Dyckia shot and can’t wait til mine gets that big. Wait, that ain’t right.